Howard Selina is a British artist born in West Yorkshire in 1948. He studied at St Martin's School of Art (1966-69) and at the Royal Academy Schools (1969-72). 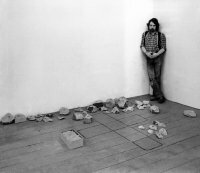 He had six solo exhibitions in London in the 1970s: at Situation Gallery, Thomas Gibson Gallery, PMJ Self Gallery, and Gallery House. Selina's exhibition at Gallery House was held during a key period for London's avant-garde when the directors, Sigi Kraus and Rosetta Brooks, ran one of London's most influential art spaces from 1972-73. Selina was also included in the New Tendencies Exhibition in Zagreb the same year (1973). Selina spent time in the USA in the 1970s before returning to London where he lived and worked, particularly in publishing and illustration, until he moved full-time to his studio in West Yorkshire in 2006. Individual vintage photograph from documentary sequence. Over the course of one day, the stone was broken into numbered pieces, and the process recorded.